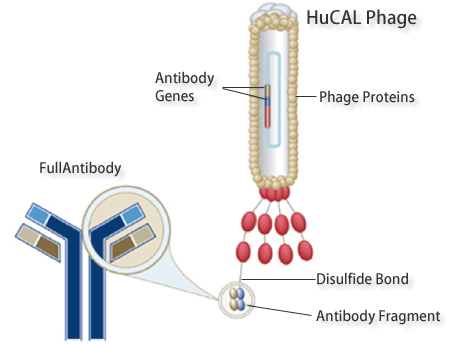 HuCAL® stands for Human Combinatorial Antibody Library, a unique synthetic collection containing billions of recombinant human Fab antibodies which encompass the human antibody repertoire. HuCAL® Custom Monoclonal Antibody Generation service is provided only in Japan. If you live in outside of Japan, please visit their site. HuCAL was developed by our partner, MorphoSys, and is one of the most powerful methods available for producing human antibodies for research, diagnostic, and therapeutic use. Copyright © 2019, GeneFrontier Corporation All rights reserved.